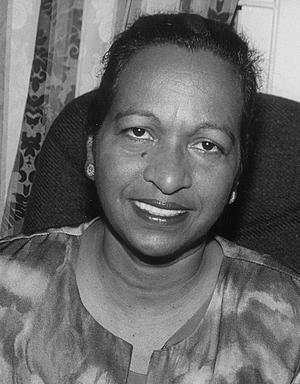 Indra Chandarpal's earliest memory of political activity is helping her parents at the age of six decorate the streets of Enmore, East Coast Demerara with buntings after the PPP victory at the 1957 general elections. She says that this was not surprising as her father was a long-time supporter of the PPP and their home was referred to as a little parliament. She has literally grown up in the party, having started work after school as a typist at Freedom House, later being appointed assistant manager of the Michael Forde Book-shop after spending a year studying political science in the Soviet Union and serving first as coordinator and later general secretary of the Women's Progressive Organi-sation (WPO), which she joined in 1970, and as an elected member of the PPP central committee since the 70s. She also served in the secretariat of the Progressive Youth Organisation (PYO) which she joined in 1968 as the secretary for culture. Chandarpal who has been a member of the National Assembly since 1992 when the PPP came to power has experience of being a frontbencher and a backbencher where she has sat since the March 2001 elections. But she finds the experience of a backbencher as fulfilling as her time as Minister, as she is a member of the Public Accounts Committee and the parliamentary sector committee on social services which she chairs and for whose meetings she spends a lot of time preparing so that she can make informed interventions. Chandarpal says too that it was convenient being a backbencher since she had been elected chairman of the Inter-American Commission on Women in 2000 which required a lot of travelling which she was able to do. About her experience as parliamentarian Chandarpal is a little disappointed at the level of debate on both sides of the aisle, explaining that she believes there is a need for more preparation for debates by parliamentarians. She says that the older parliamentarians among them Winston Murray, Harripersaud Nokta, Clinton Collymore and Cyril Belgrave and Reepu Daman Persaud give a better account of themselves than the younger ones. And it is not only the presentations that she finds at times disappointing but the heckling too. Chandarpal says she would like to spend a lot more time in the parliamentary library but that her time is often taken up with preparing for meetings and with meeting members of the communities on the East Bank Demerara to which she has been assigned by her party. She says this activity takes up a lot of time, listening to the problems of the residents of the various communities regardless of whether they support the PPP or not. She says ideally she would like to be able to have them come to an office in the area where the residents could discuss their problems with her. About her relations with the opposition parliamentarians, Chandarpal says she finds no difficulty in relating to them, particularly as the debates in the National Assembly do not take place in an acrimonious setting as both sides realise that they each have their jobs to do. "I don't know that it can change as it is the way of the world", Chandarpal says, pointing out that in relation to some other parliaments around the world, she and her colleagues in the National Assembly don't really behave so badly. Citing her experiences attending conferences abroad with opposition parliamentarians, Chandarpal says though they may have their differing positions at home, abroad it is her experience that they are Guyanese and close ranks. Two instances stand out, one of which was a conference she attended in Trinidad and Tobago for government and opposition members of the Public Accounts Committee and so closely did she and Lance Carberry work that other participants expressed the view that had they not known that the conference was for government and opposition parliamentarians they would have believed that they were members of the same party. The other occasion was a conference in France which she and James McAllister attended and they sought each other out to dine together. Chandarpal observed that those experiences tend to create a warmer relationship between parliamentarians who share them. About the stipend paid to parliamentarians, Chandarpal says recent increases have made a difference but she feels that payment of the stipend should be based on attendance, since the absence of parliamentarians really does hamper progress and as the elected representatives of the people, parliamentarians should give of their best in serving their constituents who gain no benefit from their absence. She says in addition to their pay, parliamentarians also enjoy a duty-free concession for the purchase of a car which is a great incentive and a great many people would be happy to be in their position. About the work of the social sector committee Chandarpal says eleven meetings were held during which they had agreed on a programme of work but she was disappointed that it could not be completed. This in part she says was due to a couple of meetings having to be aborted for want of a quorum. She said the committee's mandate covered nine government ministries and the committee was able to work as a team. She says they were able to cover two ministries and both ministers and a team of officials appeared before the committee. At those meetings she said there was not only a sharing of information but opportunities for clarifying issues. Chandarpal said in the meetings with Health Minister Dr Leslie Ramsammy, among the issues examined were the legal framework for the health sector, which the minister described as antiquated; the regulation of health care professionals - doctors, nurses, pharmacists etc; the regulation of private hospitals; the public heath regulations; and the expansion of the rehabilitation programmes. She said the committee also made a number of field trips to look at the health facilities at Linden where they spoke to the staff as well as identified issues of concern. As a result of the visit, Chandarpal said the committee recommended that the Linden Town Council should hand over the management of the Vivian Harris Health Centre to the Region 10 Regional Democratic Council and that the Linden Centre for the Disabled should be staffed by more trained personnel. She said the lack of trained staff to help the children with disabilities was a problem being faced not only by the Linden centre but the David Rose School and a Resource Unit for the Visually Impaired at St Rose's High School. It suggested too that through collaboration with the Ministry of Health, the services of Voluntary Service Officers experienced in this area could be requested. Also she said other recommendations were that the Ministries of Education and Health should collaborate to ensure that there was enough bio-data for the students at the centre and the need for professional attention before the students are registered at the centre. Chandarpal said the committee also identified the need for public education for the parents of children with disabilities. Chandarpal said the committee also had an interaction with some parliamentarians, officials from the Health Ministry, and representatives of the Commonwealth Youth Programme during which the programmes about HIV/AIDS were reviewed and the committee briefed on a leadership seminar in which ;leadership was identified as a vital tool in the fight against HIV/AIDS. She said at the meeting the committee was requested to be the spokesperson on HIV/AIDS-related issues and the Speaker of the National Assembly has since been written to about the request. About its deliberations on education Chandarpal said the committee identified a number of crucial issues such as truancy; school drop-outs; strengthening the services for children with disabilities; the school welfare service; and the school attendance programme and problems of drug and alcohol and children abuse. She said as a result of the meeting with Education Minister Dr Henry Jeffrey and officials from his ministry, the committee formulated a number of recommendations among which were the collection of data on the use of drugs and alcohol in schools to facilitate an analysis of the extent of the problem and to have systems to address it designed and implemented, and collaboration between the School's Welfare Division and the Probation and Family Welfare Division of the Human Services Ministry and the re-introduction of the School's Welfare Service to address the question of truancy. She explained that some 25 teachers were trained to provide an initial unit which would be further strengthened as other teachers are trained. In relation to the strengthening of the services for children with disabilities Chandarpal said the committee is recommending the establishment of a centre in the Mahaica- Mahaicony area as well as a drop-in centre in Georgetown where children with disabilities could be cared for while their parents were at work. She said that the dilemma which the committee faces is the question of follow-up but that she anticipated that with the expansion of the capacity of the Parliament Office the secretary to the committee would be able to follow up on these issues. Chandarpal has travelled widely, some of which was to attend short courses and at other times as a result of being on the executive of a number of international orga-nisations such as Women's International Democratic Federation which was headquartered in Berlin and the Guyana representative from 1985-1989 to the Caribbean Association of Feminist Research and Action. Chandarpal's ambition was to be a lawyer so that she could represent women who were the victims of violence but in those days the lack of resources was a real barrier for persons from a working-class background. However, she said that her involvement in politics allowed her to represent not only supporters of her party but the people generally who were in need of help and assistance. In this regard she said that her stint as a minister was both a humbling and rewarding experience. Two programmes stand out in her memory in her stint as a minister and these were the housing programmes which President Cheddi Jagan initiated and the Difficult Circumstances Fund which her ministry administered to more readily offer assistance to those in need. She said in the first year some 4000 persons benefited from the Fund. Chandarpal is married (she has been married for 26 years) and has two children, both grown up. One is a civil engineer and the other is pursuing a post-graduate degree in Barbados. She and her husband met while they were both serving on the secretariats respectively of the WPO and PYO. Both she said travelled extensively in the early years of their marriage but they were fortunate to have a helper who is a friend from school days and has always been regarded as a member of the family. Her children she said are not politically inclined but are committed to remaining in Guyana to serve their country. She said that she and her husband have honoured the children's wishes by keeping them out of the limelight. She said they are a close-knit family and that her husband has been her best friend for twenty-six years.